Having problems getting ideas to complete those UFOs? 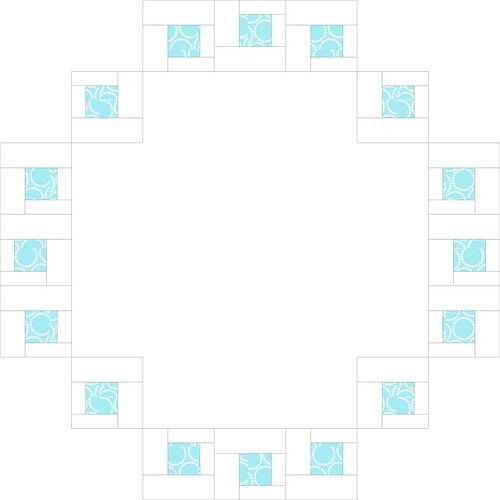 Distracted from your quilting projects because of the beautiful summer weather? Help is on the way. The Little Spark by Carrie Bloomston has 30 ideas to help you get your creative juices flowing. Thanks to donations from the generous Sam Hunter, and Alison Schmidt, the awesome visitor to May’s meeting from C&T Publishing. Two people will be lucky raffle winners at this month’s meeting! Just in time for this month’s improvisation theme a new book! 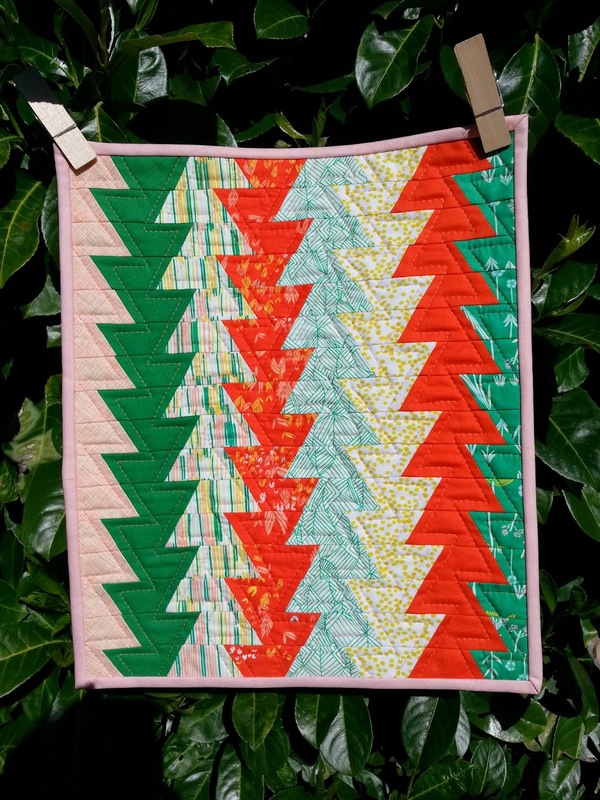 Improvising Tradition by Alexandra Ledgerwood gives quilters a guide to easily develop improvisation styled quilts by using familiar traditional quilting patterns. Patterns like log cabin, coins, one patch, and rail fence are given modern makeovers using improvisation techniques. 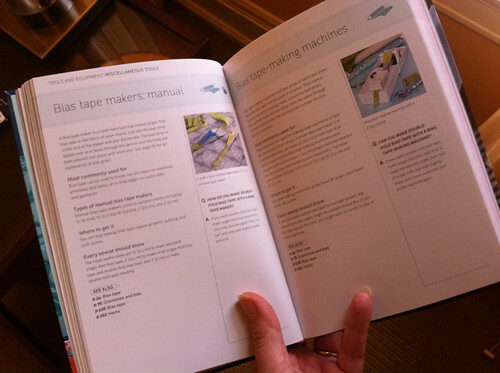 The book is divided into three sections focusing on three improvisation quilting techniques: strip setting, strata, and splice-and-insert. First, she gives a tutorial with a clear overview of each technique. Next, she clearly explains different design options then continues with step-by-step instructions in the subsection called “Here’s How”. 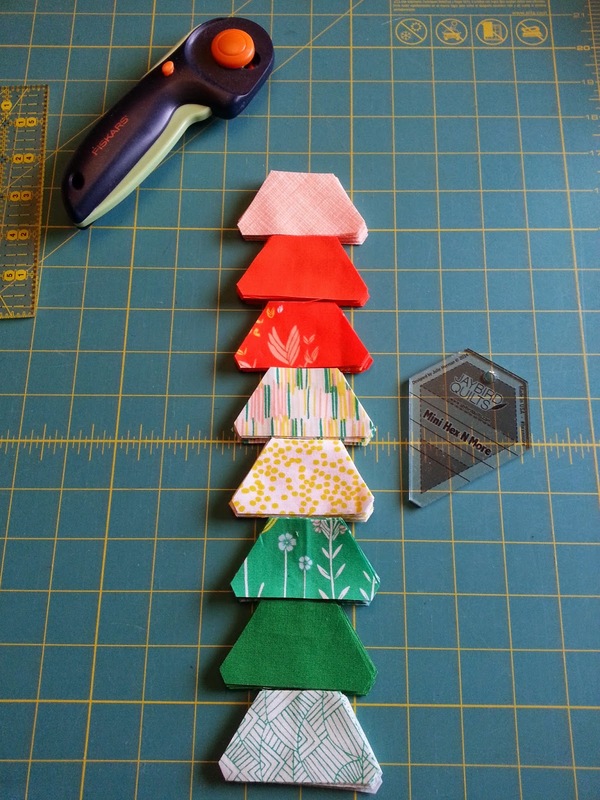 As a bonus there are tips on free-motion and hand quilting. I especially enjoyed the explanation on her approach to the decision-making process of selecting a quilting design for a quilt. 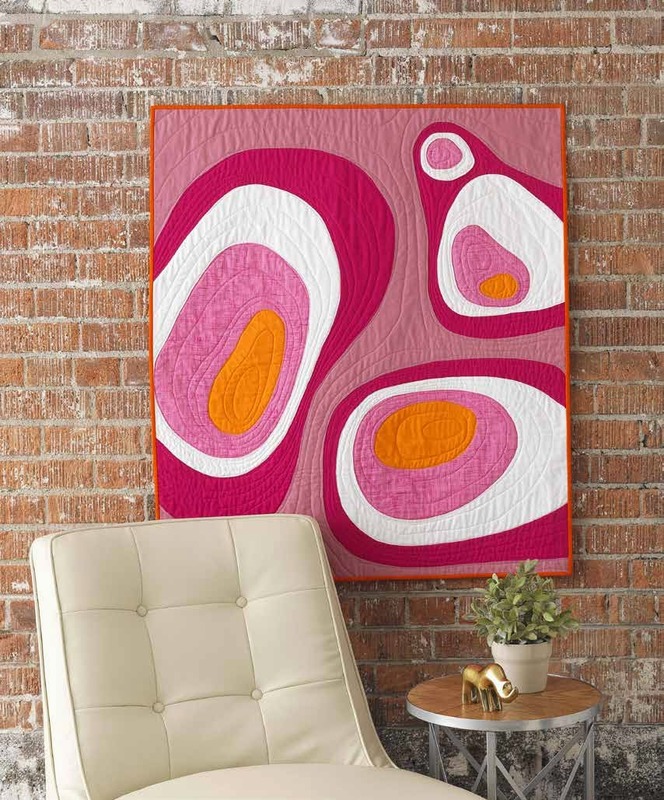 New quilters will be able to dive in and get started on making beautiful modern improv quilts with ease. 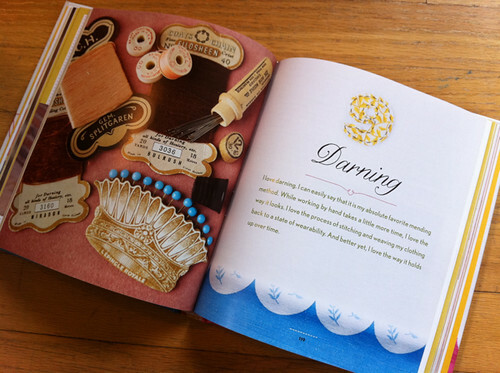 They will find the sewing tips in the beginning of the book very useful. Experienced traditional quilters will be able to use familiar skills to easily venture into modern improvisation. I saw several projects I want to make, especially the adorable mini coasters using the improv strata technique. This book is beautifully laid out and well organized with bold color photographs and clearly illustrated color instructions. It even has a helpful index, which is something you don’t see too often in many current quilts books. 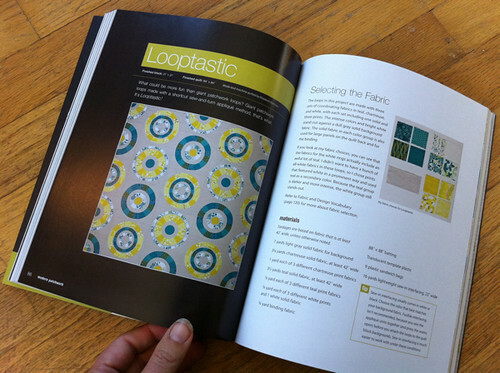 It’s a wonderful guide for modern and traditional quilters alike. 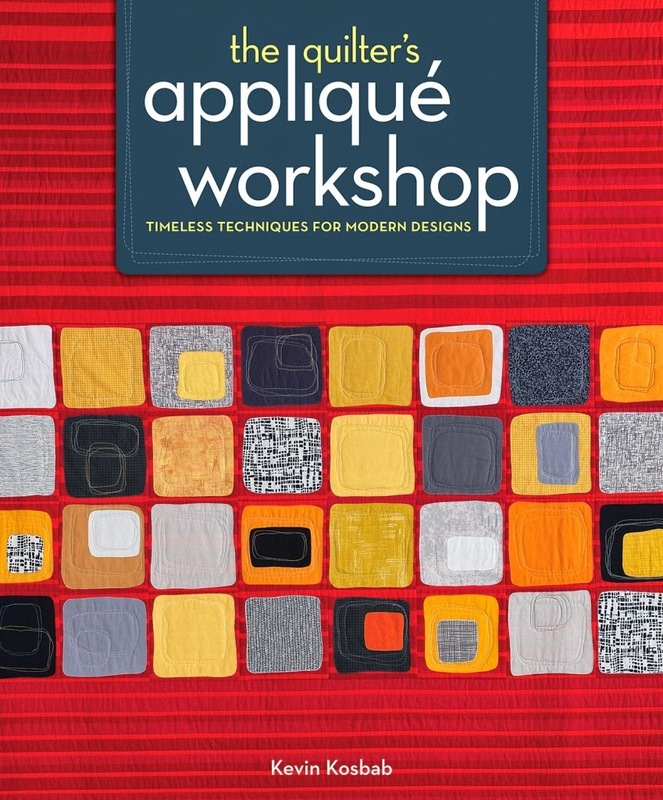 You can find the answers to these questions and many more in The Quilter’s Applique Workshop: Timeless Techniques for Modern Designs(Interweave, 2014), by Kevin Kosbab. 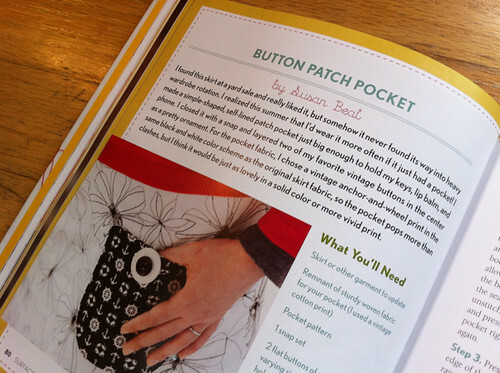 It’s an impressive handbook of techniques and projects that cover everything you need to know about sewing one piece of fabric onto another. Here's PMQG Treasurer Lisa with a book review and giveaway! 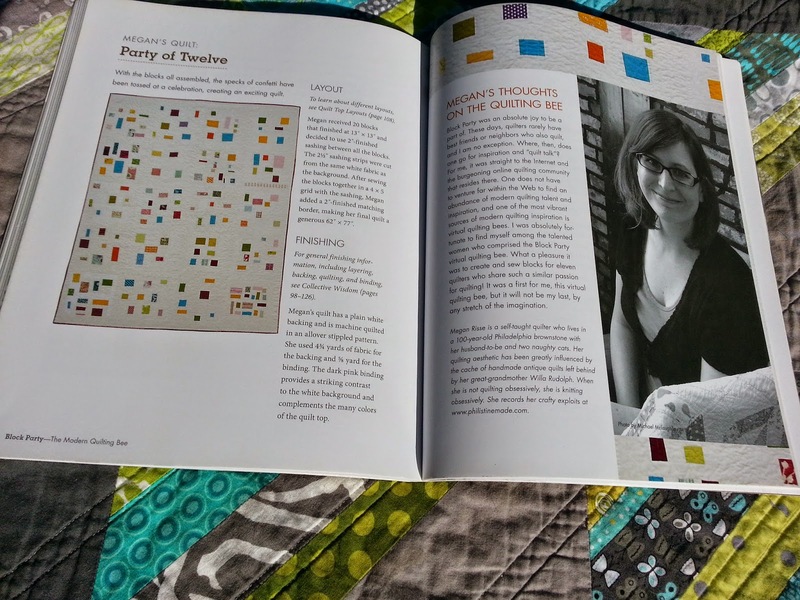 The Modern Quilting Bee Block Party (C&T, 2011) is subtitled as “The Journey of 12 Women, 1 blog and 12 Improvisational Projects.” The book details a modern, virtual quilting bee and goes into the group's process of supporting each other as they produce 12 quilts. 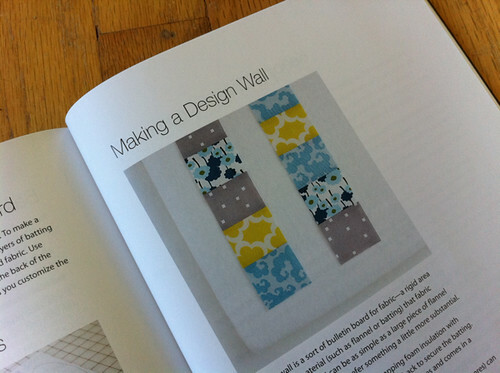 Working from a pattern in this book, I made Kristen Lejnieks’ quilt from June, which was a great beginner modern quilt. Like the other months’ patterns, it’s relatively basic, but comes together in a striking finish. The Modern Quilting Bee Block Party is a great book if you are looking for a better understanding of how bees work. Do note there are only 12 block patterns, so if you’re looking for a straightforward archive of patterns, this may not be the book for you. However, if you are looking for a book that tells a story about how the patterns were created and details the process of trying to recapture the community of the traditional bee using modern technology and a modern quilting aesthetic, then you’ll really enjoy it. 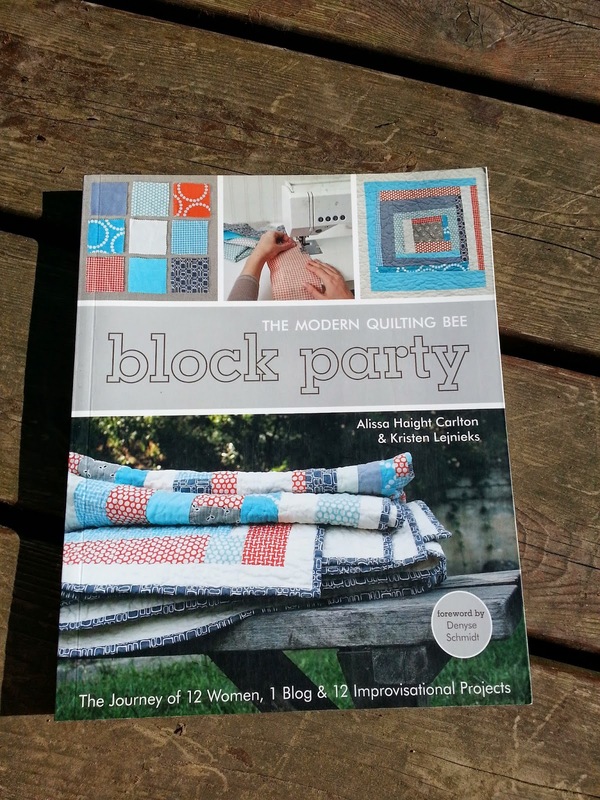 A copy of The Modern Quilting Bee Block Party will be given away at the April PMQG meeting. Lisa's "Mini Northern Lights" detail. 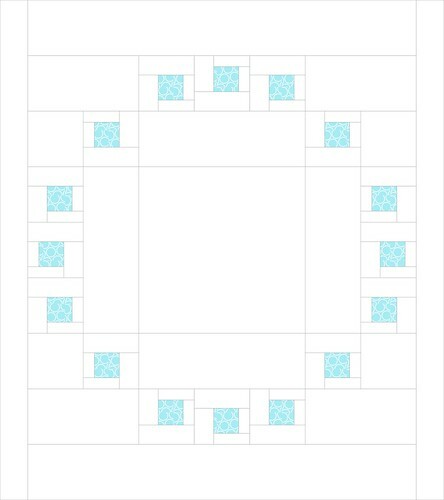 Pattern by JayBird Quilts. PMQG Treasurer Lisa here. 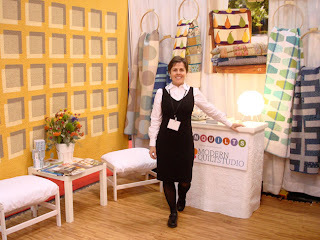 At February’s SewDown I was introduced to Julie Hermand and her amazing rulers. I had so much fun with the class that I bought one of her Mini Hex N’ More rulers to play with. The ruler cuts three different shapes in four different sizes, and while the resulting patterns looks complex, the ruler is surprisingly simple and easy to use. As an example, I made a mini-quilt from Jaybird Quilts’ “Mini Northern Lights” pattern. I love how complex the piecing looks, yet the way the pieces sew together in Julie’s clever patterns is very simple and easy to master. I used a mix of different designers’ fabrics and some solids. 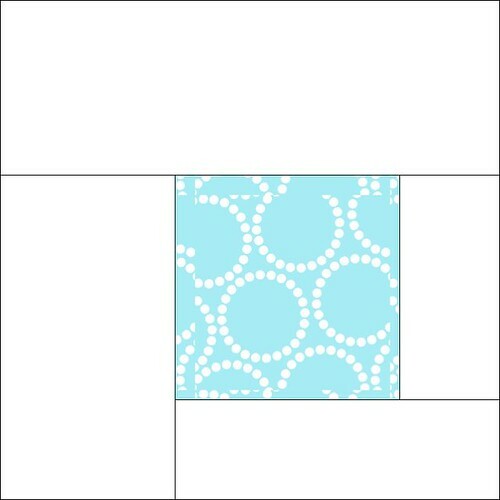 Next time, using this kind of pattern I would likely use all solids, so the pattern really pops. 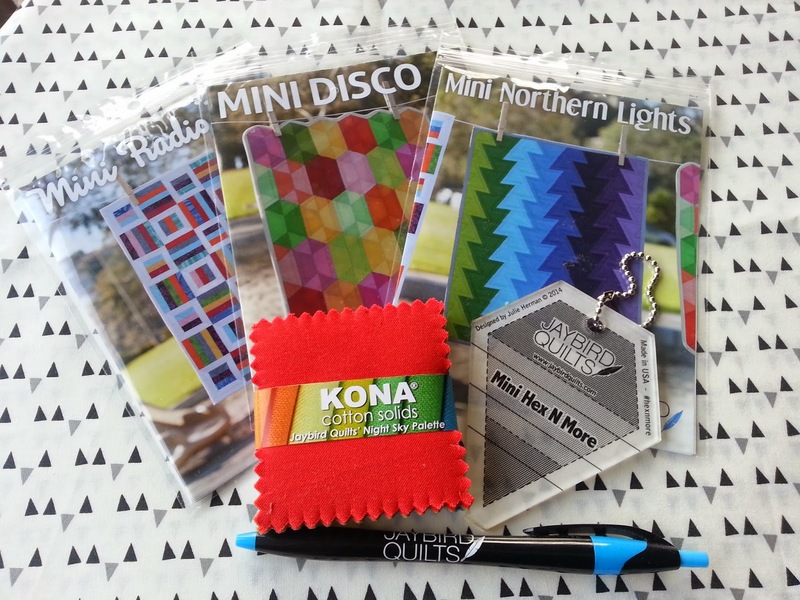 Be sure to check out the giveaways at this month’s meeting for your chance to win all this and more! Hello PMQG! 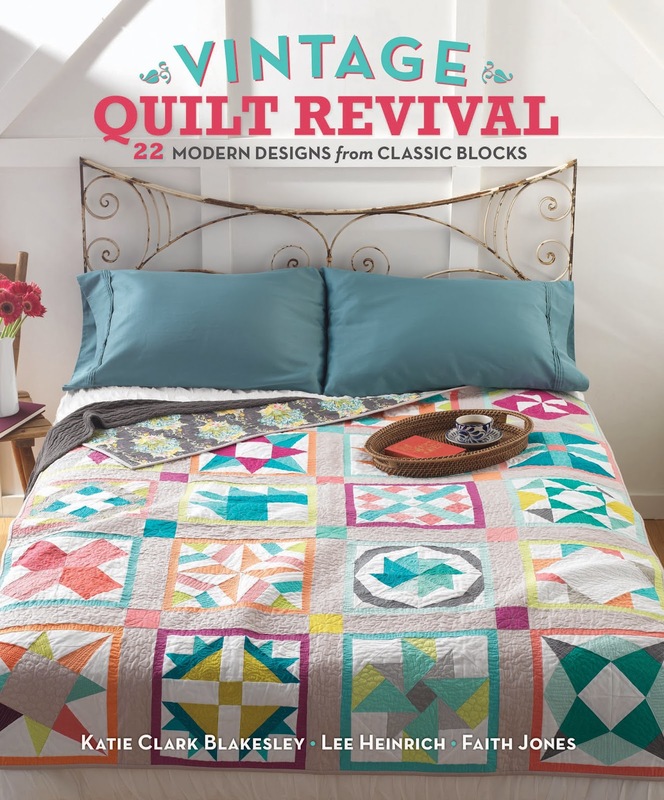 This is secretary Kelly Cole and I am here to review an amazing new quilt book from some lovely ladies from blogland: Vintage Quilt Revival. Co-authors Lee Heinrich from Freshly Pieced, Faith Jones from Fresh Lemon Quilts and Katie Blakesley from SwimBikeQuilt are not just fabulous quilters but also really accessible ladies who love to share their passion for quilting. I have been following the trio for a while, and when the buzz of Vintage Quilt Revival started I was so excited when the pictures started rolling out. 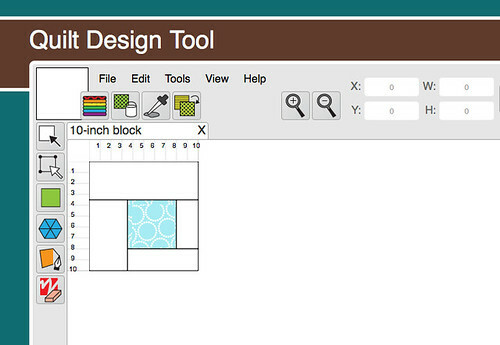 It really is a treasure trove of interesting blocks, solid quilting how-to's, and so many setting and color options. I love how each of the 20 blocks in the book has instructions on how to construct the block and then a quilt made with the block interpreted through one of the designers. And it's really them! The paper pieced blocks, colors and the settings are just spot on for each of their styles. The book feels like such an extension of their blogs. So when I asked for a copy to review and give away to a lucky PMQG member I was super happy to get a big "yes," and I dove into making a block from the book. 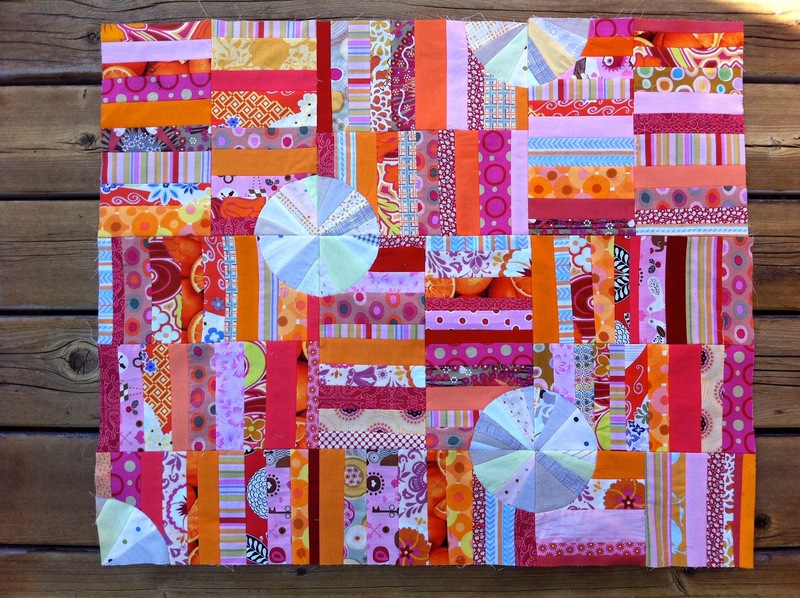 I choose the Exploding Star Block; a paper pieced block that I could not take my eyes off of! The super awesome part of this book is that it comes with an easy-to-navigate CD for printing all the paper-pieced templates. Love that! 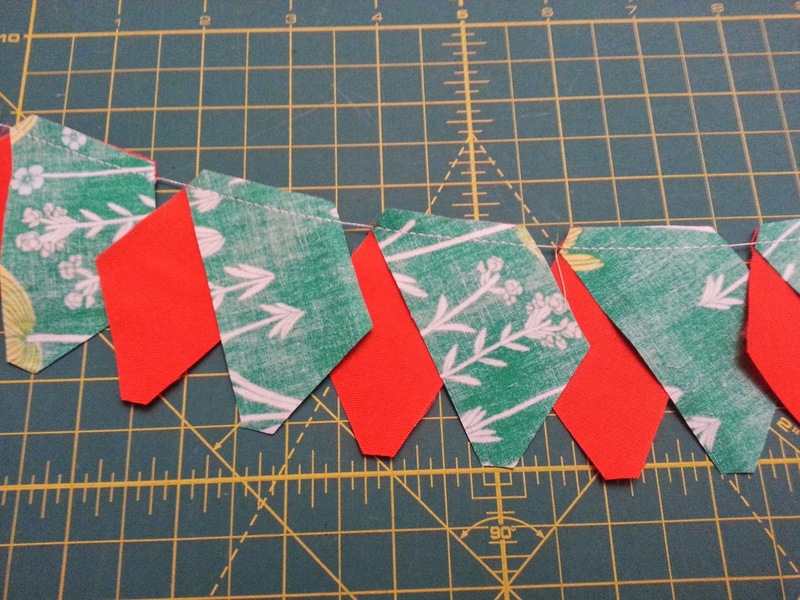 The block was super easy to make, and the points were so pointy thanks to the paper pieced method. 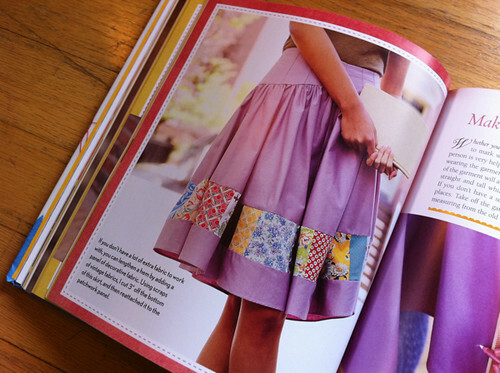 I used my favorite DS Quilt fabrics, that's how much I love this book! 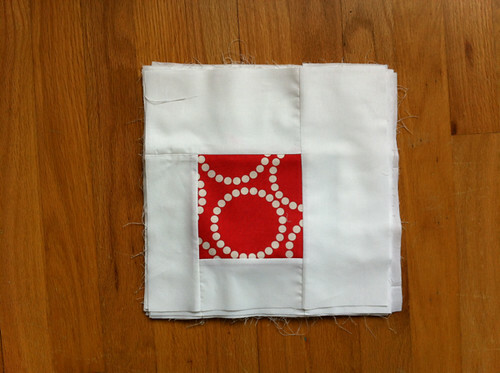 Once I made the block I sewed it up into a new pillow for the couch. A little machine quilting and hand quilting, finished off with a hidden side zipper. But I couldn't stop there! I got ambitious and made the New World Pouch too! This sweet mid-sized pouch uses a mini version of the Mayflower block and it is tiny, thanks to the paper pieced method again. I used little scraps from the pillow and some yummy Essex linen. I just love the construction details on the pouch. I finally learned this brilliant move for tabs at the end of zippers, so pro! So all in all can you tell I love this book? I am dying to get my own copy, but one lucky PMQG member will take this lovely book home at our next meeting on Tuesday, February 18! If you can't wait till then it's available for purchase right now! 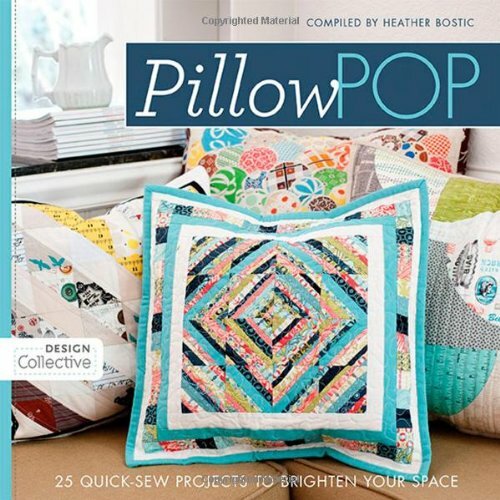 I had the chance to review the book Pillow Pop: 25 Quick-Sew Projects to Brighten Your Space, compiled by our very own Heather Bostic! She shared a little about the book at last month's meeting, and at tonight's meeting you could win this copy! Besides pillows from Heather, this book also features some of our other guild members, how cool to see in print! I loved seeing the pillows from Jen Carlton Bailly, Mo Bedell, and Joan Callaway! 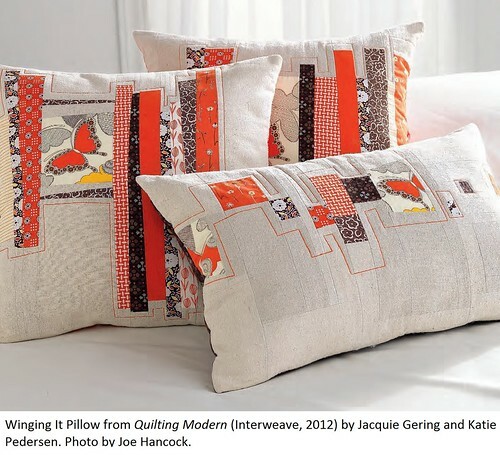 Pillow Pop shows different ways of using applique, piecing , paper piecing and embroidery to make beautiful pillows. 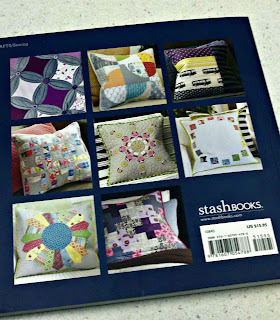 In some cases I never would have thought of using a certain technique or pattern on a pillow, and I love all the ideas browsing through this book has given me! When the generous folks over at Chronicle Books offered to send over a few copies of the Liberty Book of Home sewing, I jumped at the chance to review it. While they are famous for the diverse array of print, clothing and design offerings, they are, perhaps, most famous for their fabrics. Originally screen & block printed by hand, onto single yard lengths, they have since converted to more modern screen- printing methods. However, the base cloth, the famed Tana Lawn, remains the same as it was it 1920’s, when the blend was named for a Sudanese strain of particularly luxurious cotton. This book offers a delightful insight into the rich history of over 100 years of Liberty’s influence upon, not only the textile industry, but also the world of high fashion and design. The projects range from beginner, to intermediate sewer. They are all simple enough, but shine through the selection of fabrics. Admittedly, they would be boring in a Kona cotton or even comical in a novelty print. But, as most sewing enthusiasts know, the right print can elevate even the most simple of projects to a most treasured items. Indeed, if you’ve had the chance to handle some liberty, you know that they are fabrics to be treasured and highlighted. I think my favorite project from this book would be the hexagon quilt. I can’t think of many things more wonderful than a hand pieced liberty of London hexagon quilt. Although, either of the aprons or the slouchy bag would have a very welcome place in my home! Great projects, clearly written instructions and a serious helping of eye candy inspiration, the Liberty Book of home Sewing would make a lovely addition to any sewing library. Thanks to Chronicle, we’ll be have a copy to give away at the December meeting, as part of our membership drive. Maybe this little jewel will come home with you! 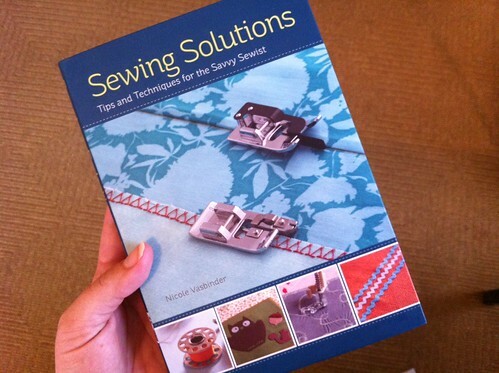 I'm very excited to review my dear friend Nicole Vasbinder's brand-new book, Sewing Solutions! Her publisher, Interweave, generously sent us a copy to give away to a lucky member at our PMQG holiday party this Thursday. 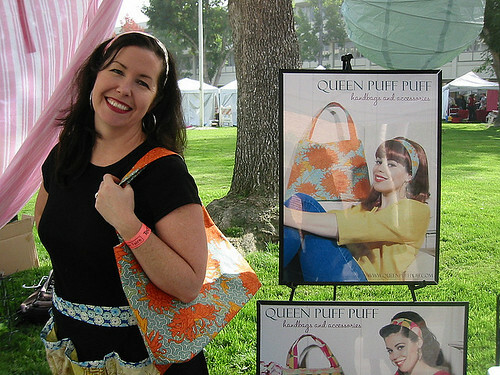 and now owns and teaches at Stitch Craft in Petaluma, California. 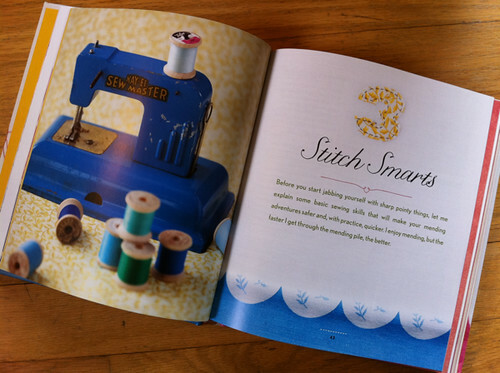 Nicole shares a wealth of insightful tips and details about the art and science of sewing in this super-handy book. 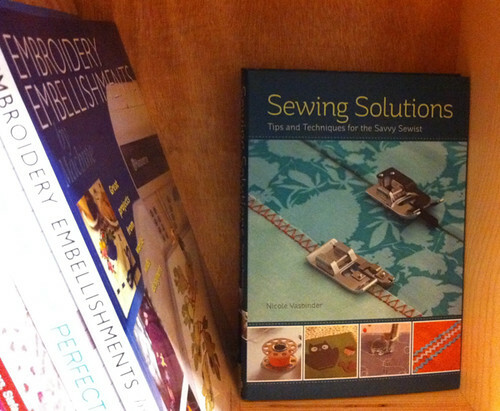 From understanding your sewing machine and serger to making perfect buttonholes, and everything in between, Nicole has you covered. Her special sections on types of fabric and notions are especially helpful. 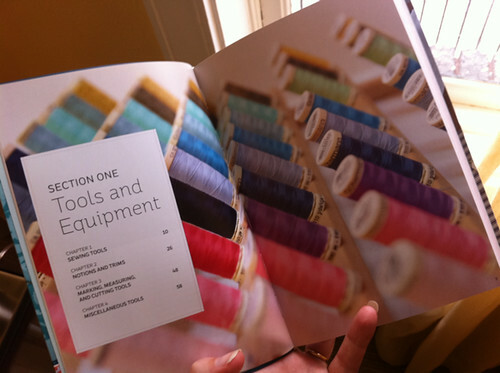 I snapped photos of pages that I thought modern quilters would especially appreciate, but there are tons of other sections that demystify every element of garment sewing, patterns and alterations, and design. She explains sewing techniques clearly, adds tips and suggestions throughout, and shares great resources for shops, books, and magazines to explore. You can win a copy of this fabulous book at our holiday party this Thursday! And if you want to pick up an extra copy, I spotted it at the downtown Powell's this afternoon (aisle 510 in the Orange Room!). 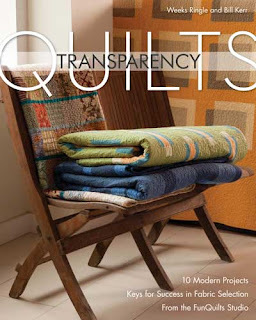 The clever folks at the Modern Quilt Studio, Weeks Ringle and Bill Kerr, have combined a color tutorial and ten modern quilt projects into their book "Transparency Quilts". 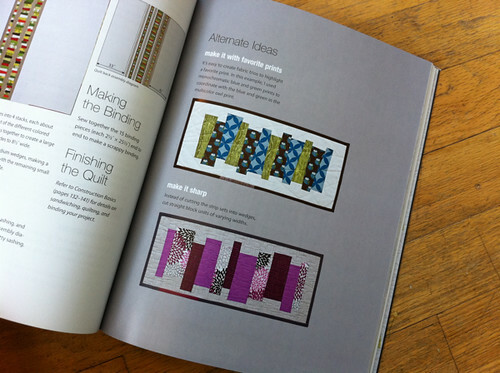 Published in 2011 by C&T Publishing, this book is a unique lesson in applying color theory to fabrics, patterns and quilts. Let me just say at the outset that this is a great addition to any quilter's library. First off, there's the whole idea of applying color theory to fabric, which is a twist on applying color theory to, say, paint. 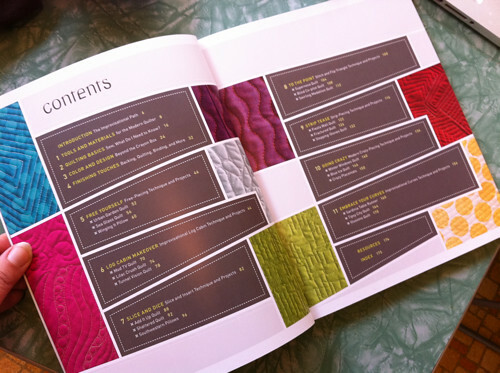 The focus of this book is to use color theory to produce patterns in fabric that mimic transparent surfaces, and begins with a case study for creating color palettes. The authors explore the role of balancing color hue and saturation in composing a successful transparency effect. 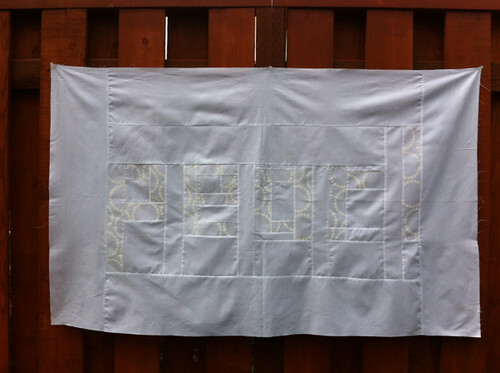 The transparencies explored in their quilt projects are modeled on various concepts, including plaids, geometric patterns, circles, and vertical strips. It's clear that Ringle and Kerr have spent time and energy developing these concepts, and yet their explanations and examples are clear and concise. Then there are the goodies! The book includes 10 quilt projects, each one rated for skill level and/or time. 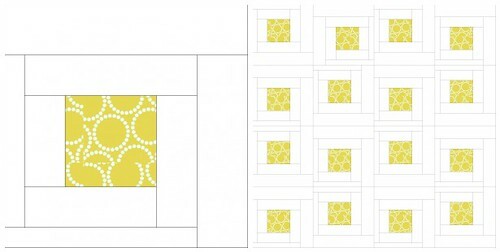 The directions are clearly separated into logical steps like cutting, block-making, and quilt assembly. The layout is clear and uncluttered, and it seemed to me that each project is very do-able. !Bonus! 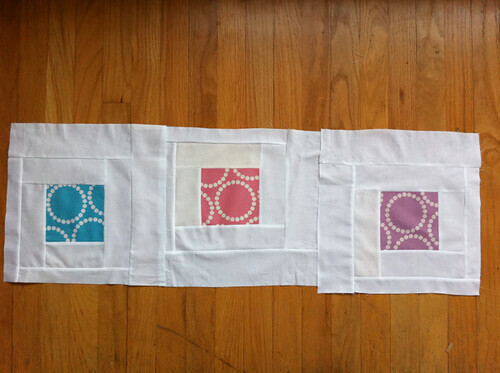 Each quilt project is sized three ways: Wall/Baby, Napping (mmm. . . ), and Full/Queen. 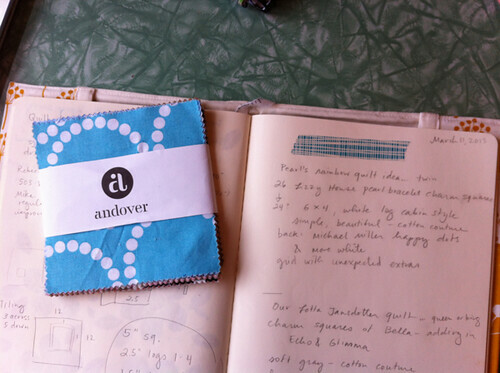 Every project is laid out with easy to follow graphic illustrations, notes and tips for layout and construction, and homey photos of each completed quilt. !Bonus Two! 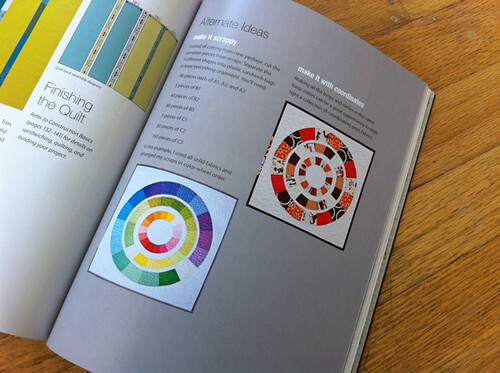 Color variations are illustrated for each project, so you can compare the effects of using different color combinations. 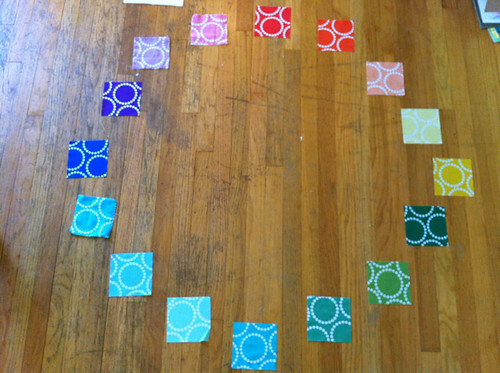 The authors have even shown the quilting pattern and thread color they used for each of their finished pieces. The more I looked at this book, the more I wanted to make at least a couple of these quilts. Ringle and Kerr have really done their homework and put together a really great lesson on composition and color for the modern quilter. Someone at our December meeting will win a copy of this book and take home a great reference and project compendium--will you be the lucky one? The Book : a December PMQG give-away! 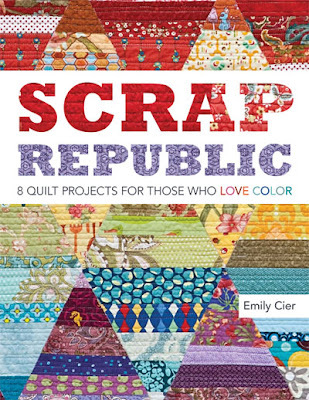 You know I love a good scrap project and when I got the opportunity to review Scrap Republic by Emily Cier I couldn't say no. Do you have a million scraps? Yes me too. Two things I love about the book are all the beautiful color photos and wonderful illustrations. The book has 8 really good quilts along with a "Solace for the Scrapless" inspiration for each so it's a book for anyone. I decided to make a mini version of the Pivot Quilt. While I was in Sister's for the Outdoor Quilt Show I was able to finish the top and it had a nice little photo shoot. Thank you to Paula for imparting more of her photo knowledge on me! 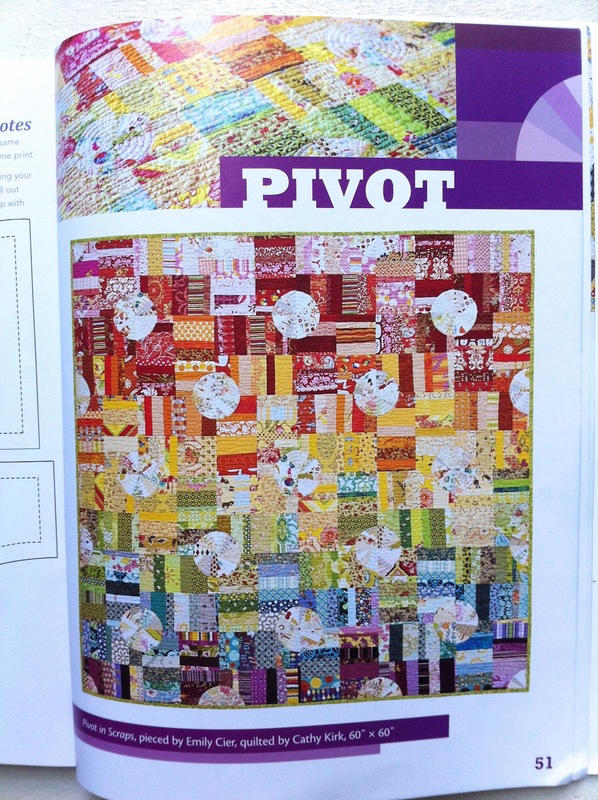 Here is the full Pivot Quilt. I love the color transition but I didn't think it would be as effective small scale and I have a lot of orange, pink, and red scraps so I stuck with those. Rachel has graciously offered to quilt it for me I'll be sure to share when it's done. I honestly love all the quilts in the book and there is a good range of quilts for different skill levels.The illustrations are well done and are really concise and easy to understand. There is a great section with tips and techniques at the beginning of the book to get you started. If you are a newer quilter you might need to read over some quilt instructions a few times, I had to at one point, but I wouldn't let that stop you from buying the book! My house mates in Sisters were passing it around and were unanimously impressed. Emily also has a new book Pixel Play coming out in August that you can pre-order right now. 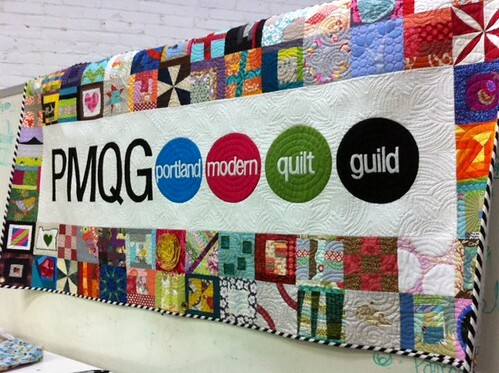 For all of you Portland Modern Quilt Guild members we will be giving the book away at our meeting this Thursday I hope to see you there. Meeting details will be on the blog tomorrow. 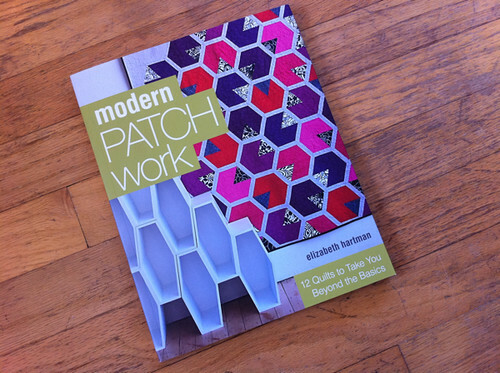 I'm very excited to review Elizabeth Hartman's gorgeous new book Modern Patchwork today, and we're so looking forward to Elizabeth sharing some of her quilts in a special presentation at tomorrow night's PMQG meeting! 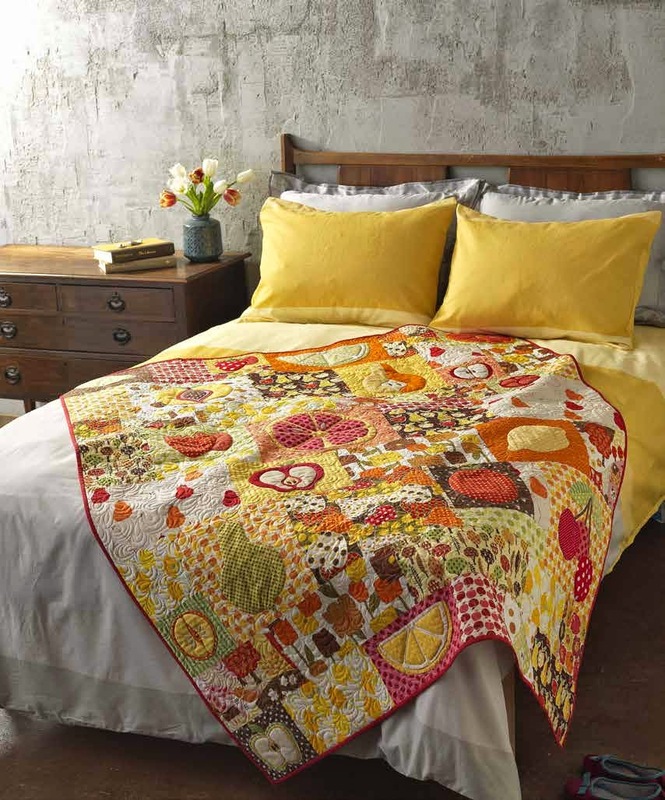 Modern Patchwork includes a dozen new quilt designs to take you beyond the basics - territory beautifully covered in her first book, The Practical Guide to Patchwork. 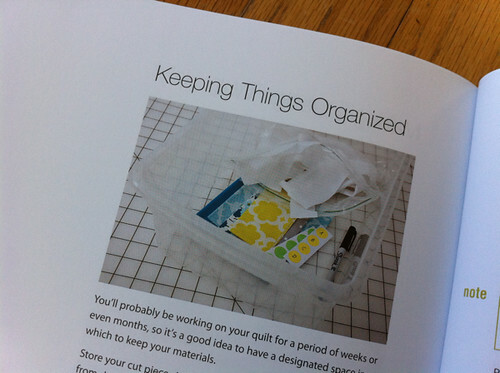 Along with full, detailed instructions for creating each quilt, she shares many extra tips and ideas in the back of the book (more on that in a minute). I wanted to spotlight two of my favorite quilts from the collection. Looptastic is a stylish and striking design of concentric circles, created through a surprisingly simple, straightforward sew-and-turn applique method. 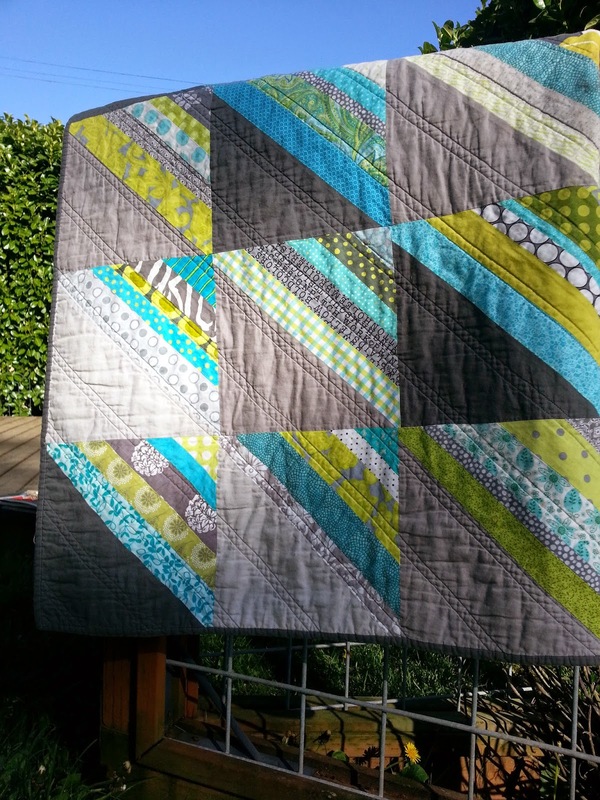 I love the aqua and citrus colors Elizabeth used in this quilt - inviting and full of life. 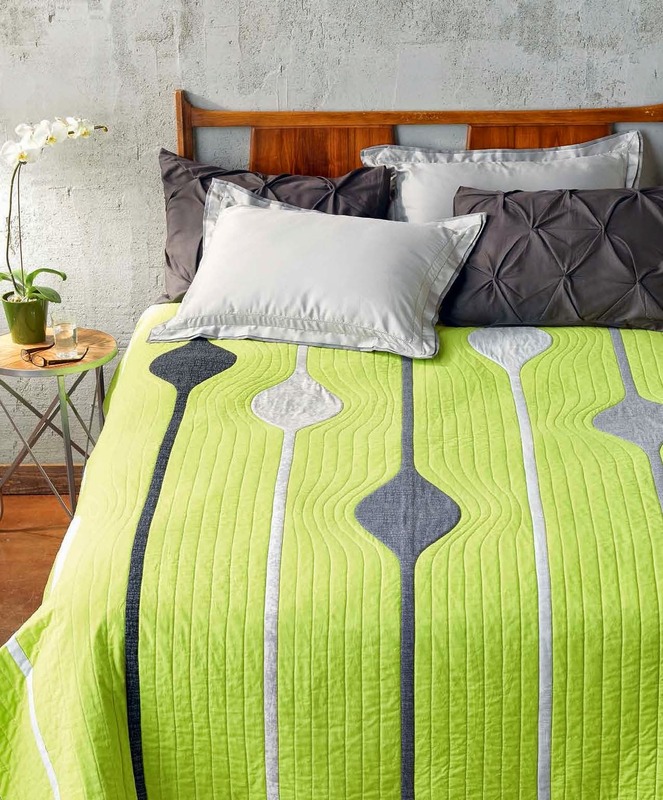 But if you have another vision in mind, she offers a lovely alternative: two other totally different color and style options, each created as a mini one-block quilt. 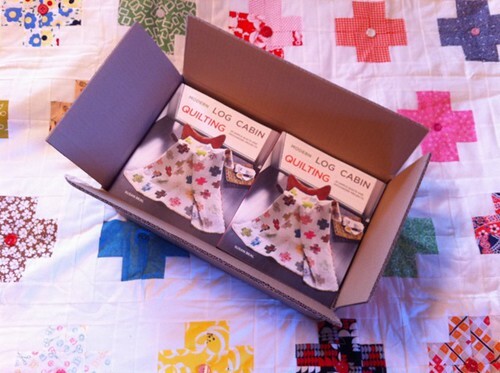 Each quilt in the book gets this wonderfully open-ended treatment! 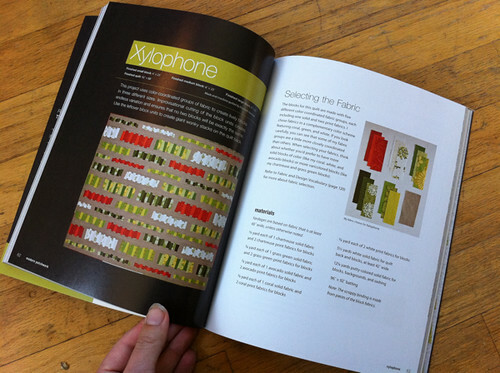 I also love Xylophone, a lively, colorful, angular design that sweeps across a neutral background. It reminds me of her Chopped Vegetables pillow patterns, another instant favorite. And of course she has some interesting alternate takes on this one to share as well! and some of her signature patterns for free-motion machine quilting. (If you're interested in free-motion, I highly recommend her class at Modern Domestic, or if you're not local, checking out her posts on the topic over at her blog). We are so thrilled that Elizabeth will present at tomorrow evening's PMQG meeting (7 pm in room S1 in the Stagecraft Building, across the street from the main PNCA building). She'll be giving away copies of the book*, fabric, and templates** to lucky winners, so make sure to put your name in the bucket. And check out her blog, Oh Fransson, for a July 1 announcement of a new Modern Patchwork quilt-along! *Thank you to Stash for sending a review copy of the book, plus the ones to give away at our meeting! **Speaking of templates, our own Jill Collins of PMQG offers templates from many of the Modern Patchwork quilts (including Looptastic, Honey, Fire Drill, Happy Hour and Owl Eyes) in her Tabslot Etsy shop! 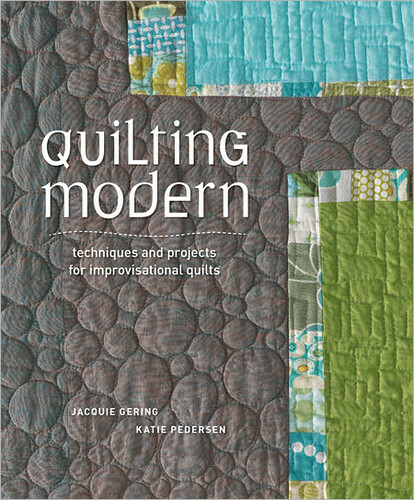 I'm so happy to be part of Katie and Jacquie's blog party weekend of posts celebrating their stellar new book, Quilting Modern! Katie is president of the SMQG and Jacquie is past president of the KCMQG, a current member of the CMQG, and on the national board too. These two know their modern improvisational quilting, and they generously share so many beautiful ideas, packed into one gorgeous book! 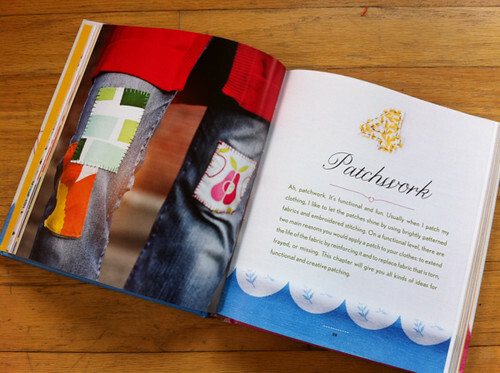 I love improvisational patchwork (and was very lucky to take Denyse Schmidt's classes at PNCA), and Katie and Jacquie's thoughtful designs, techniques, tips, and details are wonderfully illuminating. 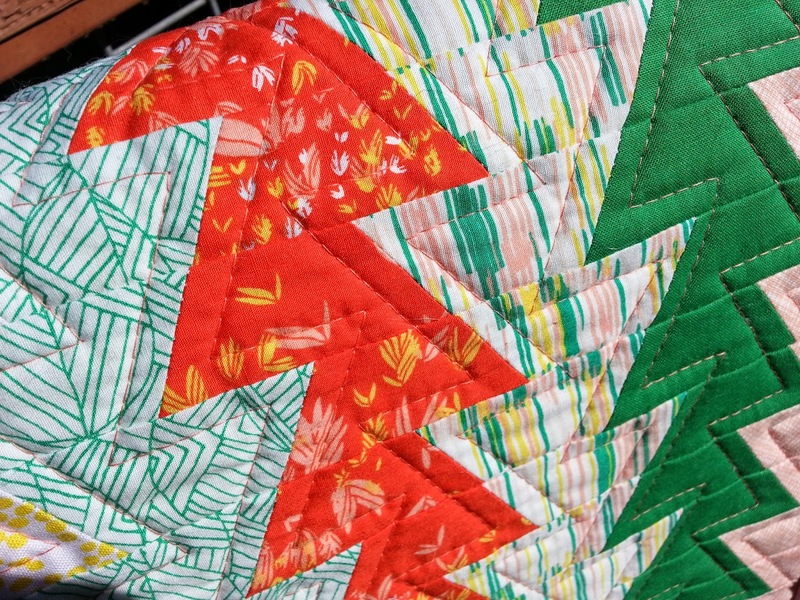 They cover many facets of modern quilting, like improvisationally piecing curves, creating sharp, perfect triangle designs, and one of my favorites, the log cabin makeover - they offer seven core techniques in all, each with three projects to sew. 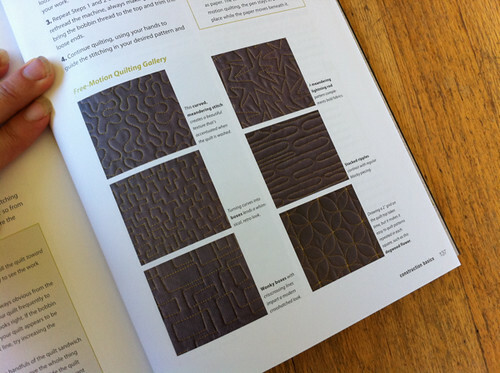 The table of contents gives a nice peek at the diversity of approaches and techniques (and I love the names they chose for their quilts!). 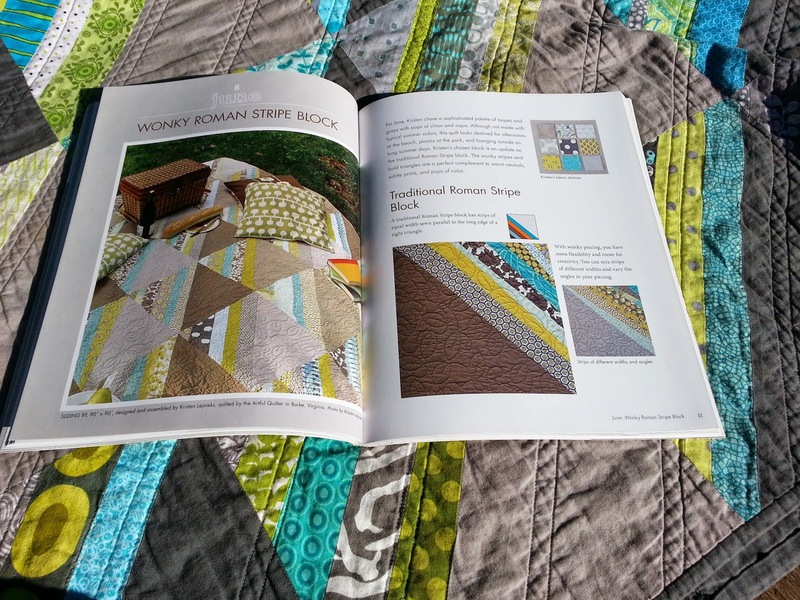 I'm sure many of the other bloggers will cover the 16 beautiful quilt designs in the book - but for my review I wanted to spotlight the striking smaller projects Katie and Jacquie designed for the home. With two little ones and not much free sewing time lately, a beautiful pillow or table runner is more my realistic speed, and these projects are also very scrap- and stash-friendly... a nice bonus! When I first got my copy and read right through it, I was immediately drawn to the Winging It Pillow, which builds a simple, stunning design around a focus-fabric scrap. The mix of erratic-height vertical piecing, bright, strong colors, and ultra-streamlined background is so appealing. This one is at the top of my to-sew list (and I love Katie's invisible zipper technique, which is also included in the book). 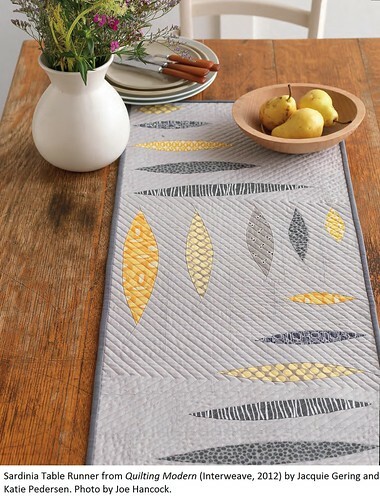 My favorite of the three is the Sardinia Table Runner, a calm, serene, and gorgeous design with neatly curved "pods" (that Jacquie's husband thought looked like sardines, so that's where the name came from). This is another one I could see as a larger quilt. 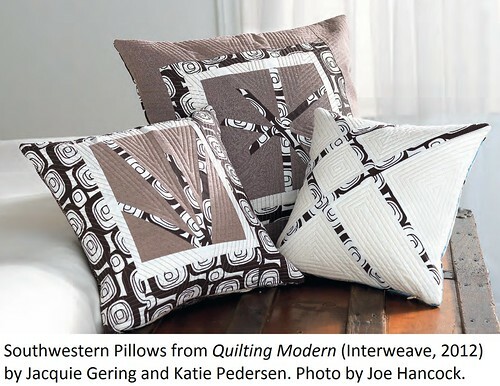 Angela Walters did a great deal of the quilting in the book, but Katie and Jacquie quilted these three projects. I loved the simplicity of these neatly alternating-angle diagonal lines over the curves and solids - a beautiful texture. 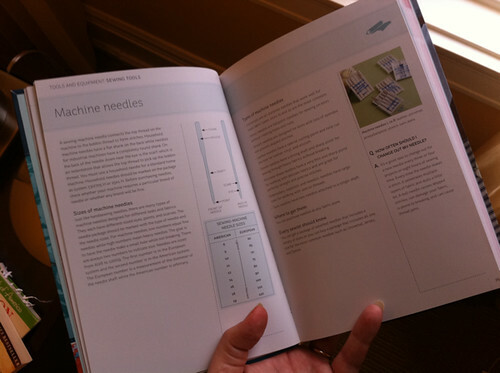 I will bring a copy of Quilting Modern for everyone to check out at our PMQG All-Day Sew tomorrow afternoon (at Fabric Depot from 9-9, though the book and I won't be there til around 1:30), and I'm so thrilled that we'll also be giving a copy away at the June 21 PMQG meeting. Thank you to Katie and Jacquie for including me in their book party, and to Interweave for sending two copies of the book for me to review and offer up at PMQG! Mend It Better review + giveaway! 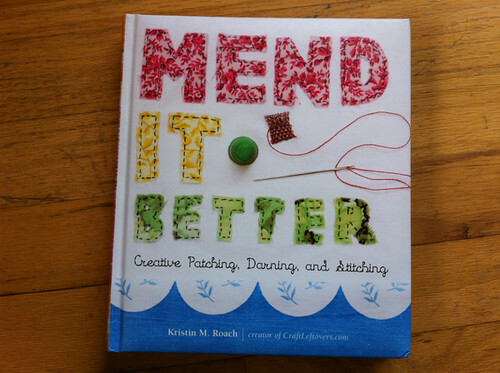 I'm very excited to be reviewing Mend It Better, a wonderful new craft book by Kristin M. Roach (also author of the lovely blog/project/zine Craft Leftovers) today! Mend It Better offers a wide variety of useful techniques, from darning and patchwork to weaving and crochet, for reworking and salvaging garments and beyond. 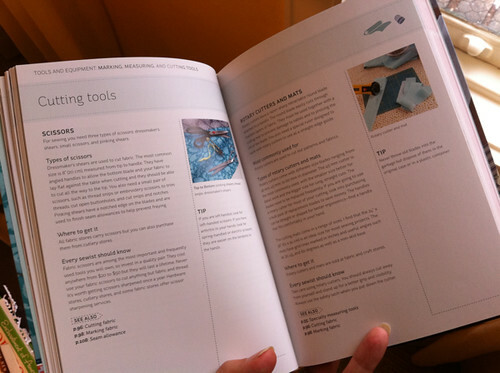 As Diane noted in her recent review, Mend It Better is arranged like a textbook, with her suggested techniques neatly organized by chapter. There are tons of photos and tips for undertaking a new mending project, which is also a nice touch. 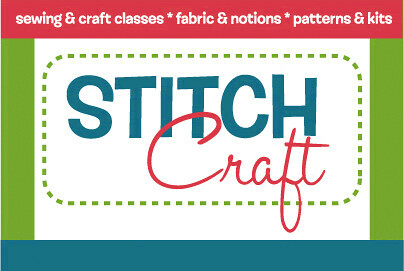 Do you have any favorite decorative stitches for covering a seam or line in a mended patchwork project? I know it's so bland, but I really love the whip stitch or overcast stitch. Just going to town and completely covering it, kind of sloppy, in a bright color! What's your favorite mending or embellishment use for binding tape? I love using it as straps, or sometimes a little accent in a seam, like small piping. So cute! 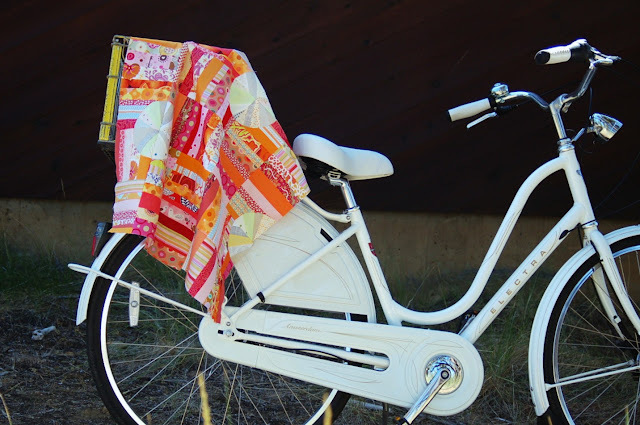 Have you ever mended a larger quilt or patchwork project? Any general tips for that? 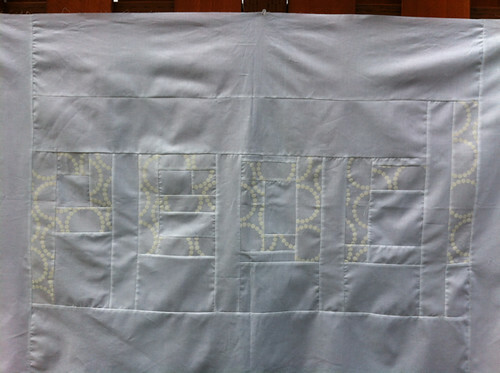 I've done some light mending on a quilt I made - one of my first sewing projects - just some basic patchwork. 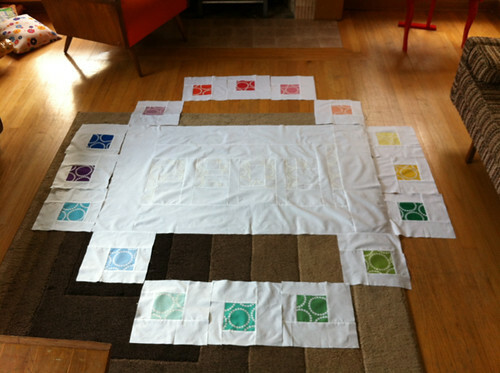 I'm really excited to be embarking on a huge mending adventure this year: restoring a quilt my husband's grandma made. She passed away a long time ago and it's in tatters. He doesn't remember her, so it's his only connection to her. It's going to be one of those "for the love of it" projects because mending it will probably take more time than completely making a new one! 1. DO NOT wash it before you mend it. It will just make the damage worse. 2. Unlike darning where you want to stretch the fabric taut, if you stretch the quilt in a hoop before making the basic structural repair, it will actually cause the fabric to ripple when you take it off, or stretch the tear even further. You'll want to mend it while it's flat, then repair any quilting stitches in the hoop only after the structure is sound. 3. 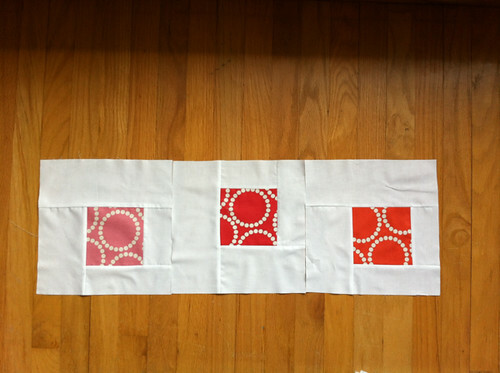 If you can, work on a large smooth surface with the quilt completely flat. The kitchen floor works great! 4. Sometimes you won't be able to match the pattern exactly when patching, if that's the case, think accent vs "sloppy". One of my teachers used to always say "do it or don't do it". So if you can't match, make it look intentional. Bold contrasting colors can be really fun! I think quilters, sewists, lovers of vintage, upcyclers, and wardrobe-refashioners will all love this book. This pieced-vintage-fabric skirt hem idea Kristin included is my favorite project... so adorable! I'll be giving away a copy of Mend It Better at our PMQG meeting at 7 pm this Thursday, April 19 at PNCA. We'll be meeting in room S1 upstairs in the Stagecraft Building right across the street from the main PNCA building (where we've met the last two months as well). Hope to see you there! *Here's my little project! Thanks so much again, Kristin!